We study marine life histories, behaviour and physiology of marine organisms, in particular responses to environmental stressors understood as adaptations or constraints. Many such studies are essential for the conservation and management of stocks as well as the responses to climate change. We cover two main areas: (1) behaviour and physiology in adult stages and (2) biology of invertebrate larvae and juveniles. We study the growth responses, in terms of rates of protein synthesis as well as trade-offs in energy allocated by organisms in growth vs. metabolism. Model species include fishes and marine invertebrates (echinoderms, molluscs and crustaceans). Growth and protein synthesis (McCarthy): Proteins are central to life playing a key role in maintenance metabolism through the synthesis and breakdown of structural, catalytic and other metabolically-active proteins, with growth occurring when rates of protein synthesis exceed breakdown. It has been estimated that protein synthesis accounts for 11 to 42% of the basal metabolism in ectothermic and endothermic animals with protein breakdown accounting for an additional energetic cost that, although currently unquantified, may be equivalent to the cost of synthesis. Thus, the cycle of protein turnover (i.e. patterns of synthesis and breakdown) is a fundamental physiological process underlying not only changing patterns of tissue replacement and growth during ontogeny and ageing, but also providing the mechanisms allowing animals to adapt to changing environmental conditions and planes of nutrition. Our research has examined how protein metabolism is influenced by abiotic factors such as temperature, salinity and pCO2 (Ocean Acidification) to determine the adaptive capacity of marine bivalve molluscs, crustaceans and echinoderms to compensate for future climate change. In addition we have examined how pollutants can increase the energy expenditure in fish through increases in the rate of protein turnover. 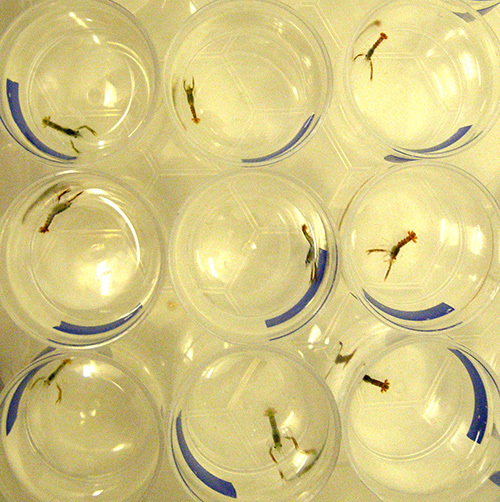 Rates of protein synthesis are usually measured using the flooding dose technique; we have used this technique in our research validating its use for the first time in invertebrate taxa such as echinoderms and bivalve molluscs. Whole-animal and cellular metabolism (McCarthy): as well as examining protein in the context of climate changes, our research, in collaboration with Dr Nia Whiteley in Biological Sciences, has examined the effects of abiotic factors such as temperature, salinity and pCO2 (Ocean Acidification) on the metabolism of marine bivalve molluscs and crustaceans. We use respirometry to measure metabolic rates at the whole-animal level and the Cellular Energy Allocation technique at the cellular level. Growth in marine molluscs. Bangor has a long and strong tradition in studies of incremental growth of bivalve and gastropod shells. We use laser ablation inductively coupled plasma mass spectrometry (LA-ICP-MS) (studies in collaboration with the British Geological Survey). Using such method, we have identified the longest lived non colonial animal known to science. Past research included the study of mechanism of formation of semi-diurnal, diurnal and annual microgrowth patterns. Current studies use of mollusc shells as archives of environmental change; see our work on sclerochronology). Consistent individual differences (CIDs) in physiology and behaviour drive individual fitness (i.e. survival and reproductive output) under variable environmental conditions and hence provide the frameworks through which natural selection can operate and through which populations will cope with future climate change. Underlying this concept is the assumption that in order for selection to be able to operate, individuals will display consistent levels of performance in fitness-related traits, i.e. they will maintain the same levels of performance and/or the same relative performance ranking over time compared to other individuals. We are studying individual variation and CIDs in marine crustacean, bivalves and fishes in a range of labile physiological and behavioural performance traits such as protein synthesis, locomotor performance, immunocompetence and boldness. Most marine invertebrates develop through a pelagic larval stage. At SOS, we study the larval biology of marine crustaceans, covering two main areas: responses to stressors and ecological consequences of phenotypic plasticity. Responses to stressors (Gimenez): work attempts to understand responses to salinity, temperature and food limitation. Recent work evaluates the capacity of decapod larvae to tolerate limited access to food either due to the patchy nature characterising the pelagic habitat as well as the larval patterns of vertical migration. For instance European lobster larvae cope very well with food limitation as long as they are fed for a minimum of 4 h a day; such capacity has been demonstrated also in other species over a wide range of temperatures. We also carry out multiple-stressor approaches to the study of individual level responses, considering temperature, food limitation, salinity and emergent compounds. The latter are anthropogentic stressors deriving from the use of chemical substances such as Ibuprofen or Chlotrimazole. More recently we are studying effects of Ocean acidification and osmotic stress on larvae, a fact that has relevance for climate change research. Plasticity (Gimenez) is one of the mechanisms organisms have available to cope with environmental variability. A major area of research is the study of within and trans-generational plasticity in marine crustaceans. Studies of trans-generational plasticity cover effects of maternal conditions of phenotype on the larval development of marine crustaceans, for instance effects of maternal size on larval body mass and responses to food limitation. Ecological consequences of intraspecific phenotypic variation. (Gimenez and Jenkins) Phenotypic variation is the stuff of evolution: such variation arises through developmental mechanisms that have evolved by natural selection, and hence are of interest for evolutionary biologists. Ecology has tended to ignore intra-specific phenotypic variation and abstract species or populations as made of identical organisms. However, there is a growing body of work showing that variation in traits of organisms can have important consequences for recruitment. For instance, plastic responses to the environment exhibited by larval stages can affect the trait of organisms at or after metamorphosis (these are the so called carry over or latent effects, i.e. effects of the larval environment on the phenotype of juvenile stages). Variations in key traits, such as those affecting the capacity of juveniles to escape from predators or find food or shelter can have consequences for their survival. Such carry over effects can have strong implications for recruitment and are part of the study of trait-mediated effects carried out at the population level ( see population-level studies on larval ecology).